Respect is important for you and everyone around you. Respect is not something that can be demanded, as it will not last. Respect is something that is offered firstly, then earned secondly. It is one of those “karma” things. To get respect, you must first give respect. When you show respect for others, it might not mean a lot to you at the time. However, it could mean the world to the other person. And that is part of your service to others. 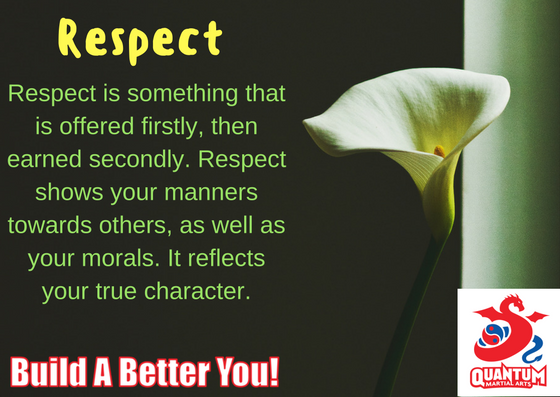 Having respect for all around you says a lot about your true character. At Quantum Martial Arts, we do not just want you to be better martial artists. We want you to be better people. We want to “build a better you”. My challenge from my Sensei is to say “please” and “thank you’ more often. I have been consciously doing this over the last fortnight (more than I usually would) and it brings a pleasant happiness to all of my interactions. Having respect for others guides your manners. So when you say “please” and “thank you” more often, you are showing respect for that person. You never how others will react, but hopefully they will show you respect back. Mutual respect has just occurred from a simple “please” and “thank you”. Consciously try it this week and see how you go. And “thank you” for being part of this wonderful Quantum Martial Arts / Northstar Ju Jitsu community. I love coming to the dojo to spend time with all of you. The dojo is my place where I can block out the rest of the world and having fun training martial arts with like-minded people. Thank you for making this fun and thank you for being part of my life. If you like this article, please share it with your friends using the social media links below. We very much appreciate your support.